'I'm the Boss' is a game of deal making and negotiation, where you are an investor just trying to make a deal. Through intelligent negotiations, temporary alliances, and cutthroat bargaining you will rake in millions. But watch out for the other investors at your bargaining table who meddle in your affairs and try to take over your deals. As the boss, you stand to gain the most, but you can find yourself quickly cut out of a deal. In the end, the winner is the investor with the most money. Finally someone has published an English version of Sackson's Kohle, Kies, & Knete! If you've wanted this game for years and couldn't find an affordable copy, now's the chance. Thanks Face 2 Face! 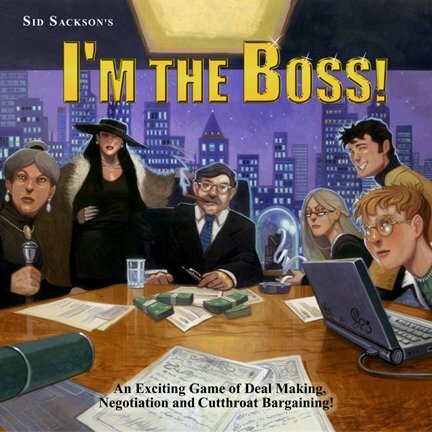 A brilliant classic that's all about making the best deal for you, slapping down cards to stop other players from butting in on your share, and just when you've had enough, playing the "I'M THE BOSS!" card to take charge of the proceedings. If you're not playing this one loudly, you're playing it wrong. Great, great game.